The Java ecosystem is made up of many individuals, organisations and companies producing many different libraries. Some of the largest projects have long had support options where users of the project, typically corporates, can pay for an enhanced warranty, guaranteed approach to bug fixes and more. Small projects, run by a single individual or a team, have been unable to offer this service, even if they wanted to. In addition, there is a more subtle problem. The amount a small project could charge is too low for a corporate to pay. 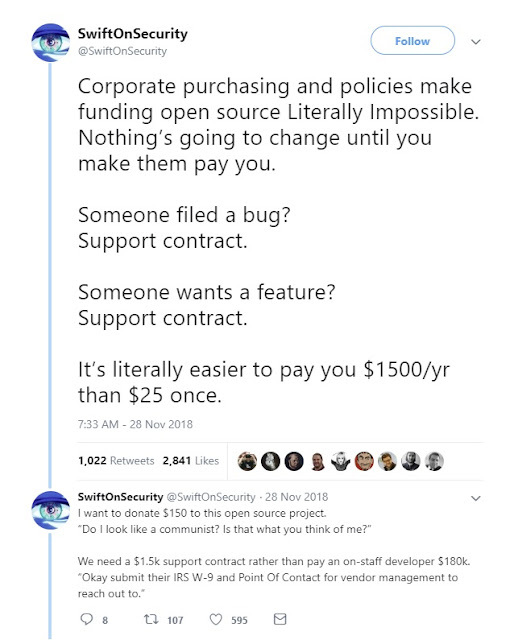 As the thread indicates, it is basically impossible for a corporate to gift money to a small project, and it is not viable for small projects to meaningfully offer a support contract. The problem is that not paying the maintainers has negative consequences. Take the recent case where a developer handed his open source project on to another person, who then used it to steal bitcoins. I believe there is now a solution to the problem. Tidelift. Tidelift offers companies a monthly subscription to support their open source usage. And they pay some of that income directly to the maintainers of the projects that the company uses. Maintainers are expected to continue maintaining the project, follow a responsible disclosure process for security issues and check their licensing. Tidelift does not get to control the project roadmap, and maintainers do not have to provide an active helpdesk or consulting. See here for more details. As such, I'm now offering commercial support for Joda-Time, Joda-Money, Joda-Beans, Joda-Convert, Joda-Collect, ThreeTen-Extra, ThreeTen-backport via the Tidelift subscription. This is an extra option for those that want to support the maintainers of open source but haven't been able to find a way to do so until now. The Joda and ThreeTen projects will always be free and available under a permissive licence, so there is no need to worry as a result of this. Should you adopt Java 12 or stick on Java 11? Should you adopt Java 12 or stick on Java 11 for the next 3 years? Seems like an innocuous question, but it is one of the most important decisions out there for those running on the JVM. I'll try to cover the key aspects of the decision, with the assumption that you care about running with the latest set of security patches in production. TL;DR, It is vital to fully understand and accept the risks before adopting Java 12. There is now a new release of Java every six months, so Java 12 is less than five months away despite Java 11 having just been released. As part of the process of moving to more frequent releases, certain releases are designated to be LTS (long term support) and as such will have security patches available for four years or more. This makes them "major" releases, not because they have a bigger feature set but because they have multi year support. It is expected that Java 11 patches (11.0.1, 11.0.2, 11.0.3, etc.) will be smaller and simpler than Java 8 updates (8u20, 8u40, 8u60, etc.) - Java 11 updates will be more focused on security patches, without the internal enhancements of Java 8 updates. Instead, Oracle want us to think of Java 12, 13, 14 etc. as small upgrades, similar to an imaginary Java 11u20, 11u40 etc. To be blunt, I find this nonsensical. Senior Oracle employees have repeatedly argued that updates such as 8u20 and 8u40 often broke code. This was not my experience. In fact my experience was that update releases primarily contained bug fixes. The only break I can remember was the addition of --allow-script-in-comments to Javadoc, which isn't a core part of Java. As a result, I have never feared picking up the latest update release - and this has been a core benefit of the Java platform. Going from Java 9->10->11 is closer to going from 8->8u20->8u40 than from 7->8->9. As the table clearly shows, each version in the Java release train can contain any change traditionally associated with a full major version. These include language changes and JVM changes, both of which have major impacts on IDEs, bytecode libraries and frameworks. In addition, there will not only be additional APIs, but also API removals (something that did not happen prior to 8). Oracle's claim is that because each release is only 6 months after the previous one, there won't be as much "stuff" in it, thus it won't be as hard to upgrade. While true, it is also irrelevant. What matters is whether the upgrade has the potential to damage your code stack or not. And clearly, going from 11 -> 12 -> 13 has much greater potential for damage than 8 -> 8u20 -> 8u40 ever did. The key difference compared to updates like 8u20 -> 8u40 are the changes to the bytecode version, and the changes to the specification. Changes to the bytecode version tend to be particularly disruptive, with most frameworks making heavy use of libraries like ASM or ByteBuddy that are intimately linked to each bytecode version. And moving from 8u20 -> 8u40 still had the same Java SE specification, with all the same classes and methods, something that cannot be relied on moving from 12 to 13. I simply do not accept Oracle's argument that the "amount of stuff" in a release is more significant than the "type of stuff". Note however that another one of Oracle's claims really does matter. They point out that if you stick with Java 11 and plan to move to the next LTS version when it is released (ie. Java 17) that you might find your code doesn't compile. Remember that the Java development rules now state that an API method can be deprecated in one version and removed in the next one. Rules that do not take LTS releases into account. So, a method could be deprecated in 13 and removed in 15. Someone upgrading from 11 to 17 would simply find a deleted API having having never seen the deprecation. Lets not panic too much about removal though - the only APIs likely to be removed are specialist ones, not those in widespread use by application code. In this section, I try to outline some of the considerations/risks that must be considered before adopting the release train. If you adopt Java 12 and use a new language feature or new API, then you are effectively locking your project in to the release train. You have to adopt Java 13, 14, 15, 16 and 17. And you have to adopt each new release within one month of the next release coming out. Remember that with the new release train, each release has a lifetime of six months, and is obsolete just seven months after release. That is because there will be only six months of security patches for each release, the first patch 1 month after release and the second 4 months after release. After 7 months, the next set of security patches come out but the older release will not get them. Do your processes allow for a Java upgrade, any necessary bug fixing, testing and release within that narrow 1 month time window? Or are you willing to run in production on a Java version below the security baseline? There are many possible things that can block an upgrade of Java. Lets make a list of some of the common ones. Insufficient development resources: Your team may get busy, or be downsized, or the project may go to production and the team disbanded. Can you guarantee that development time will be available to do the upgrade from Java 15 to 16 in two years time? Build tools and IDEs: Will your IDE support each new version on the day of release? Will Maven? Gradle? Do you have a backup plan if they don't? Remember, you only have 1 month to complete the upgrade, test it and get it released to production. Under this section other tools include Checkstyle, JaCoCo, PMD, SpotBugs and many more. Dependencies: Will your dependencies all be ready for each new version? Quickly enough for you to meet the 1 month deadline? Remember, it is not just your direct dependencies, but everything in your stack. Bytecode manipulation libraries are particularly affected for example, such as ByteBuddy and ASM. Frameworks: Another kind of dependency, but a large and important one. Will Spring produce a new version every six months, within the narrow one month time window? Will Jakarta EE (formerly Java EE)? What happens if they don't? Now the traditional approach to any of these blockers was to wait. With versions of Java up to 8, a common approach was to wait 6 to 12 months before starting the upgrade to give tools, libraries and frameworks the chance to fix any bugs. But of course the waiting approach is incompatible with the release train. What about hosting of your CI system? Will Jenkins, Travis, Circle, Shippable, GitLab be updated quickly? What do you do if they are not? Perhaps you have read through the list above and are happy your code and processes today can cope. Great! But it is critical to understand that you are also restricting your ability to change in the future. For example, maybe your code doesn't run on AWS Lambda today. But are you willing to say you can't do so for the next three years? And I've probably forgotten something. Don't get me wrong. I think it is perfectly possible to make a choice to say that you are willing to take the risk. That the benefits of new language features, and probable enhanced performance, make the effort worthwhile. But I strongly believe it is more risky than remaining on Java 11. One possible middle ground is to develop your application for Java 12, but run it in production on Java 13, 14, 15 etc. as soon as they come out. Sadly, this approach is less viable than it should be. The removal of APIs and changes to the bytecode version add uncertainty to the stack. Even if your code doesn't use one of the removed APIs, one of your libraries might. Or a bytecode manipulation library might need upgrading, with knock on effects. So while the middle ground is a possible fallback if you get stuck, it is far from a no-risk solution. Jaba 8 and 11 as the LTS branches officially supported from our end. Best efforts support for the releases inbetween. ... if you intend to upgrade to 12 ... we are very willing to work with you ... but they are not officially production supported. ... The long term support releases are what we are primarily focussed on. Java 12 and higher will be best effort from our side. Liferay has decided we will not certify every single major release of the JDK. We will instead choose to follow Oracle's lead and certify only those marked for LTS. Oracle's official "misconceptions" slide about the new release model. I'm sure some development teams will adopt the Java release train. My hope is that they do so with their eyes wide open. I know we won't be adopting the release train at my day job any time soon, a key blocker being our use of AWS Lambda, but I'd be concerned about all the other points too. Feel free to leave a comment, especially if you think I've missed any points that should be on the considerations list. Moving from Java 8 to Java 11 is trickier than most upgrades. Here are a few of my notes on the process. You do not have to modularise your code to upgrade to Java 11. In most cases, code running on the classpath will continue to run on Java 9 and later where modules are completely ignored. This is terrible for library authors, but great for application developers. So my advice is to ignore modules as much as you can when upgrading to Java 11. Turning your application into Java modules may be a useful thing to consider in a few years time when open source dependencies really start to adopt modules. Right now, attempting to modularise is just painful as few dependencies are modules. Some parts of the JDK have been removed. These were parts of Java EE and Corba that no longer fitted well with the JDK, or could be maintained elsewhere. If you use Corba then there is little anyone can do to help you. However, if you use the Java EE modules then the fix for the deleted code should be simple in most cases. Just add the appropriate Maven jars. On the Java client side, things are more tricky with the removal of Java WebStart. Consider using Getdown or Update4J instead. Sun and Oracle have been telling developers for years not to use sun.misc.Unsafe and other sharp-edge JDK APIs. For a long time, Java 9 was to be the release where those classes disappeared. But this never actually happened. What you might get with Java 11 however is a warning. This warning will only be printed once, on first access to the restricted API. It is a useful reminder that your code, or a dependency, is doing something "naughty" and will need to be fixed at some point. What you will also find is that Java 11 has a number of new APIs specifically designed to avoid the need to use Unsafe and friends. Make it a priority to investigate those new APIs if you are using an "illegal" API. For example, Base64, MethodHandles.privateLookupIn, MethodHandles.Lookup.defineClass, StackWalker and Variable Handles. Modules and the new six-monthly release cycle have conspired to have a real impact on the tooling and libraries developers use. Some projects have been able to keep up. Some have struggled. Some have failed. When upgrading to Java 11, a key task is to update all your dependencies to the latest version. If there hasn't been a release in since Java 9 came out, then that dependency may need extra care or testing. Make sure you've updated your IDE too. But it is not just application dependencies that need updating, so does Maven (and Gradle too, but I don't know much about Gradle myself). Most Maven plugins have changed major versions to a v3.x, and upgrading Maven itself to v3.5.4 is also beneficial. Sadly, the core maven team is very small, so there are still some bugs/issues to be solved. However, if your Maven build is sensible and simple enough, you should generally be OK. But do note that upgrading a plugin from a v2.x to a v3.x may involve changes to configuration beyond that just associated with modules. 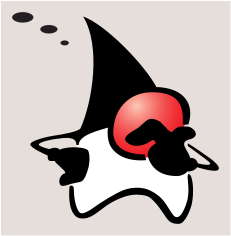 For example, the Maven Javadoc plugin has renamed the argLine property. A key point to note is the way Maven operates with modules. When the Maven compiler or surefire plugin finds a jar file that is modular (ie. with a module-info.class) it can place that jar on the modulepath instead of the classpath. As such, even though you might intend to run the application fully on the classpath, Maven might compile and test the code partly on the classpath and partly on the modulepath. At present, there is nothing that can be done about this. Sometimes your build will need some larger changes. For example, you will need to change Findbugs to SpotBugs. And change Cobertura to JaCoCo. These build changes may take some time - they did for me. But the information available by a simple web search is increasing all the time. Having done these migrations, my conclusion is that the pain is primarily in maintaining compatibility with Java 8. Moving an application to Java 11 should be simpler, because there is no need to stay tied to Java 8. Comments welcome, but note that most "how to" questions should be on Stack Overflow, not here! From Java 11 its time to think beyond Oracle's JDK. Time to appreciate the depth of the ecosystem built on OpenJDK. 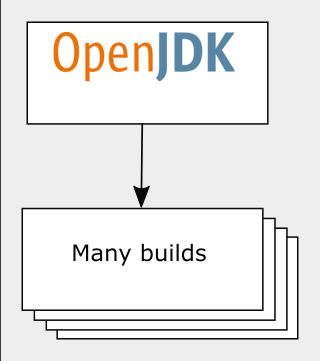 Here is a list of some key OpenJDK builds. In practical terms, there is only one set of source code for the JDK. The source code is hosted in Mercurial at OpenJDK. Anyone can take that source code, produce a build and publish it on a URL. But there is a distinct certification process that should be used to ensure the build is valid. Certification is run by the Java Community Process, which provides a Technology Compatibility Kit (TCK, sometimes referred to as the JCK). If an organization produces an OpenJDK build that passes the TCK then that build can be described as "Java SE compatible". Note that the build cannot be referred to as "Java SE" without the vendor getting a commercial license from Oracle. For example, builds from AdoptOpenJDK that pass the TCK are not "Java SE", but "Java SE compatible" or "compatible with the Java SE specification". Note also that certification is currently on a trust-basis - the results are not submitted to the JCP/Oracle for checking and cannot be made public. See Volker's excellent comment for more details. To summarise, the OpenJDK + Vendor process turns one sourcebase into many different builds. In the process of turning the OpenJDK sourcebase into a build, the vendor may, or may not, add some additional branding or utilities, provided these do not prevent certification. For example, a vendor cannot add a new public method to an API, or a new language feature. From Java 11 this is a branded commercial build with paid-for support. It can be downloaded and used without cost only for development use. It cannot be used in production without paying Oracle (so it is a bit of a trap for the unwary). Oracle intends to provide full paid support until 2026 or later (details). Note that unlike in the past, the Oracle JDK is not "better" than the OpenJDK build (provided both are at the same security patch level). See here for more details of the small differences between Oracle JDK and the OpenJDk build by Oracle. These are $free pure unbranded builds of OpenJDK under the GPL license with Classpath Extension. Unlike the OpenJDK builds by Oracle, these builds will continue for a much longer period for major releases like Java 11. The Java 11 builds will continue for 4 years, one year after the next major release (details). AdoptOpenJDK is a community group. They will provide builds provided that other groups create and publish security patches in a source repository at OpenJDK. Both IBM and Red Hat have indicated that they intend to provide those security patches. In addition to the standard OpenJDK builds, AdoptOpenJDK will also be providing builds with OpenJ9 instead of HotSpot. OpenJ9 was originally IBM's JVM, but OpenJ9 is now Open Source at Eclipse. Red Hat provides builds of OpenJDK via Red Hat Enterprise Linux (RHEL) which is a commercial product with paid-for support (details). They are very good at providing security patches back to OpenJDK, and Red Hat has run the security updates project of Java 6 and 7. The Red Hat build is integrated better into the operating system, so it is not a pure OpenJDK build (although you wouldn't notice the difference). Different Linux distros have different ways to access OpenJDK. Here are some links for common distros: Debian, Fedora, Arch, Ubuntu. Zulu is a branded build of OpenJDK with commercial paid-for support. In addition, Azul provides some Zulu builds for $free as "Zulu Community", however there are no specific commitments as to the availability of those $free builds. Azul has an extensive plan for supporting Zulu commercially, including plans to support Java 9, 13 and 15, unlike any other vendor (details). In preview from 2018-11-14, this is a zero-cost build of OpenJDK with long-term support that passes the TCK. It is under the standard GPL+CE license of all OpenJDK builds. Amazon will be adding their own patches and running Corretto on AWS, so it will be very widely used. Java 8 support will be until at least June 2023. IBM provides and supports a JDK for Java 8 and earlier. They also provide commercial paid-for support for the AdoptOpenJDK builds with OpenJ9. SAP provides a JDK for Java 10 and later under the GPL+CE license. They also have a commercial closed-source JVM. Information on support lifetimes can be found here. Liberica from Bellsoft is a $free TCK verified OpenJDK distribution for x86, ARM32 and ARM64. I haven't found any information on support lifetimes. A community project sponsored by Red Hat that produces OpenJDK builds. They are the basis of Red Hat's Windows builds. The project has no customer support but does intend to provide builds so long as Red Hat supports a Java version. No information is provided about the TCK. There are undoubtedly other builds of OpenJDK, both commercial and $free. Please contact me if you'd like me to consider adding another section. There are many different builds of OpenJDK, the original upstream source repository. Each build offers its own unique take - $free or commercial, branded or unbranded. Choice is great. But if you just want the "standard", currently my best advice is to use the OpenJDK builds by Oracle, AdoptOpenJDK builds or the one in your Operating System (Linux).